Above: Tony Lucas (CAMRA), Kelvin Green (Sue Ryder) and Veronica Emary (Cheltenham CAMRA Chair). 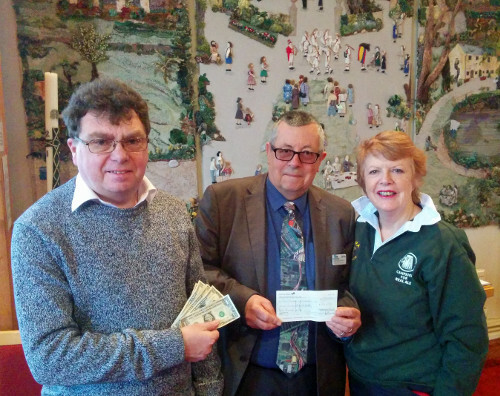 Members of Cheltenham CAMRA visited the Sue Ryder Leckhampton Court Hospice, to present the proceeds of their charity fundraising sing-along held at the Sandford Park Alehouse in December. Customers made generous donations to request to hear and sing their favourite carols, traditional pub songs, modern classics and favourite songs. Led by Grenville Hillman on piano, and ably supported by a ukulele band, the music and raffle raised £355.73 – plus US$6.00! Veronica Emary, Chair of Cheltenham CAMRA, said; “Sue Ryder’s Leckhampton Court Hospice is the only inpatient unit in the county. Together with the day hospice, the hospice at home and the family support service, Leckhampton Court is a great local resource we should all be proud of. The Hospice treated two of our loyal and committed past members with amazing care and consideration, so this is our way of saying thank you. 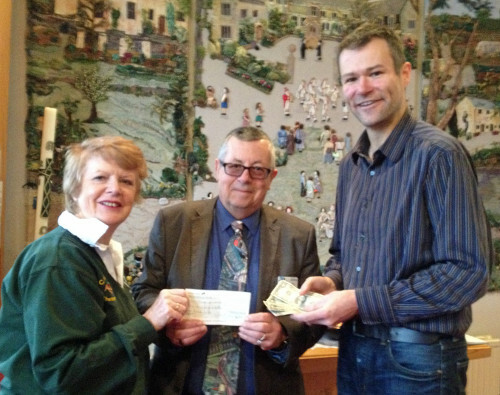 Above: Veronica Emary (Cheltenham CAMRA Chair), Kelvin Green (Sue Ryder) and Emiel Ramakers (CAMRA).